Of this acreage, 98.5% consists of Labrusca (American Grape) varieties such as 'Concord' and 'Niagara' which are used for juice, jam and other fresh or fermented products. 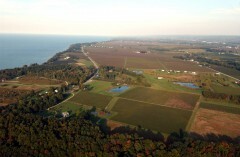 The Lake Erie Regional Grape Program consists of Extension Educators and research faculty/staff from Cornell University and Penn State University devoted to projects aimed at increasing yields, product quality, diversity and improvement of cultivars, efficiency of production, profitability and adoption of environmentally sound cultural and pest management strategies. and Erie County in Pennsylvania.